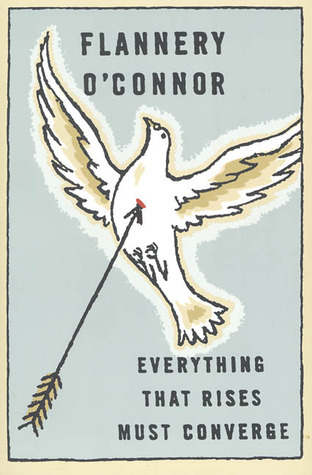 The LOST book I finished recently was Everything that Rises Must Converge by Flannery O’Connor. This is a book of short stories and it makes its appearance in LOST when Jacob is sitting on a bench outside, reading a copy, when behind him John Locke falls eight stories out of a window. 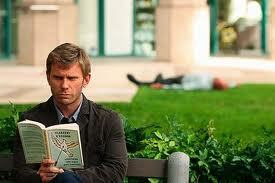 (Because his loving, Father of the Year, pushed him). I was looking forward to this one, even purchased the real thing for full price from Barnes & Noble. Well, actually, I bought it with some cash my dad gave me. Thanks Pop. It looks nice on the shelf. There are worse things to read…..some even on the LOST list…..and Flannery has a lot more stuff out there but I’ve read all I need to from this chicka. Her storytelling and her subject matter are pretty brutal. Typically, she writes about life in the south in the 50’s/60’s. The “N” word is everywhere and usually someone dies a sudden and gory death at the end. (Like John Locke, except he miraculously survives). Anyway, most of the stories are not about race, and they are not really about civil rights, they just take you to that time in southern history where black people were thought to be inferior to white people and they explore those stories with the everyday mindset that used to be. So, it’s not enjoyable, but not as intense as say, ROOTS. (Which I haven’t read, I just remember how upsetting it was to watch it on TV as a little girl). After I read the first few stories I thought that this is just a book that is full of old country stories where someone dies horribly at the end just for the sake of shock value. An example….an old woman being impaled by a loose running bull on her farm land….or death by a loving grandfather’s quick-snap, loss-of-control as he beats his grandaughter’s head on a rock. Um…yea….but after about 4 or 5 stories I began to see another, eye-opening trend. I noticed in most of the stories that there was a tension present among parents and children. Most often it was adult children and their superiority complex over their parents. They believed not only that they were more enlightened than their parents but that is was their duty to constantly be teaching and illustrating how their parents, (who raised them by the way), could be better. You know, act better, think better, just BE better….you get the idea. These attitudes probably could have been adjusted in childhood with a few trips to the woodshed. (But I suppose that is me thinking I know better.) While these adult children are busy being so much better than their parents, they are un-busy with all the help on the farm or in the everyday work that could help a mama out. Know what I’m sayin??? So, in the end, it was usually hard-working mama getting impaled by the bull or dear old son dying because he drank contaminated unpasteurized milk, (that he tried to get the black workers to drink as well to show rebellion against his white mother – they didn’t by the way, out of respect for her wishes), and of course no one knew the milk was contaminated. So, he kinda got his. It’s that kind of stuff. I’ve heard there are people who absolutely love her work. I’m glad there is something for everyone. Respect your parents people! Love one another and all that. Thanks for stopping by!! It’s nice to meet you too!! And I acknowledge, I’m no literary expert, but I love talking about books and what went through my mind when I read them. And like I mentioned on your blog, I’ve grown a lot in the last couple of years in terms of literary appreciation. Some earlier posts here may not reflect that.